I would argue that most people take the calculator apps on iPhones and Androids for granted. Sure, they're available when you need them, but it's actually pretty cool that you no longer have to own a completely separate device to complete all of your math problems. Unfortunately, the stock calculator apps are rather limited, since you don't have much customizations to make something like a mortgage or tip calculator. However, you now have the power to generate your own completely custom calculator with the help of Google Sheets, Excel and iBuildApp. You can find the Online Calculator App right here, but the true magic comes about when you generate your own little equations for unique calculations. The Calculator App runs on whatever you punch into Google Spreadsheets. Therefore, you'll need to connect the app with your own spreadsheet (follow the tutorial below,) and then think about what you'd like the app to do for you or your business. This has some amazing possibilities, since a real estate agent could make a fairly complicated mortgage calculator that beats out most of the watered down ones on the internet. What's more is that the app calculates everything from scientific equations to percentages. What else does the new calculator app support? The cool part is that even if you don't know the formula you want to achieve, it only takes a quick Google search to find someone else who does. Therefore, you can take the formula from them and punch it into the Google Spreadsheet. A great example is what you see above. 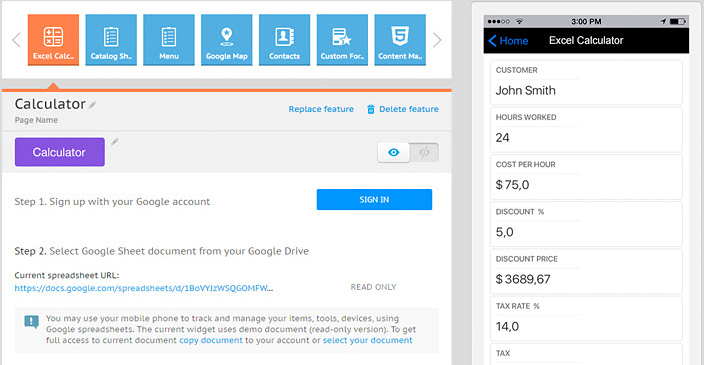 It's a nice way to generate quotes for customers without forcing them to call you. A Calculate button is located towards the bottom, and resetting only takes a quick click as well. 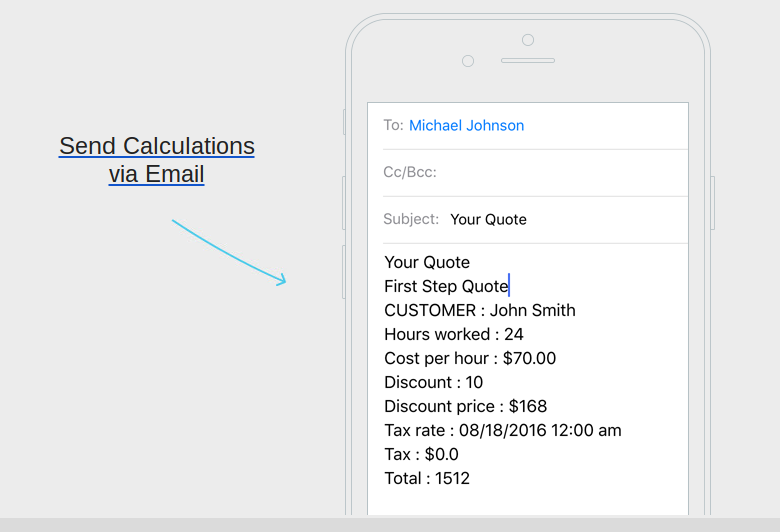 Another cool part of the app is that it lets you send calculations through email. So, if a customer requests a quote from you, all you have to do is shoot them an email without thinking about the math yourself. Login to your iBuildApp account, then go to the app management panel for the app you'd like to add the feature to. The Edit tab brings up all of the features you can add to the app. 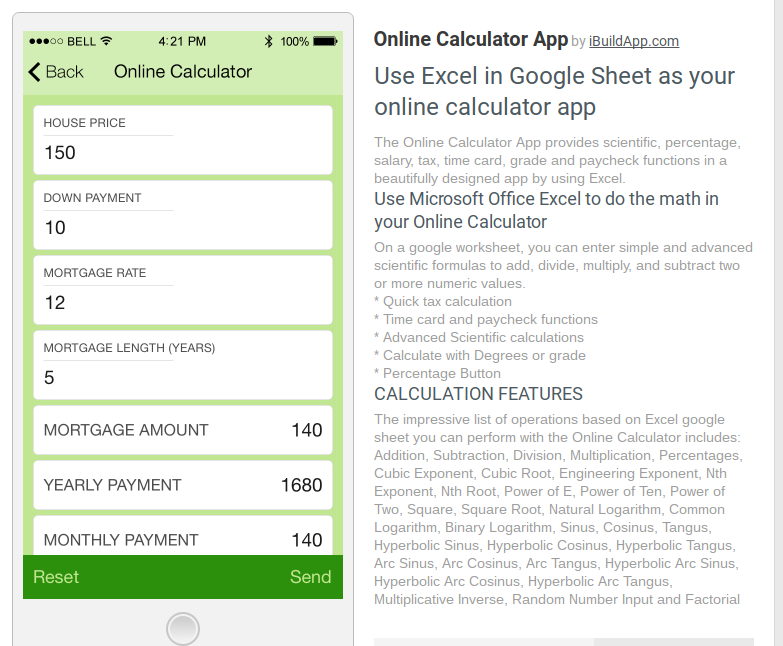 Scroll through the apps to locate the Excel Calculator option. Click on the Sign In button to punch in your Google account credentials. You must only select one Google Sheet for this to work. Keep in mind that it's best to make the sheet with your calculations before walking through this tutorial. 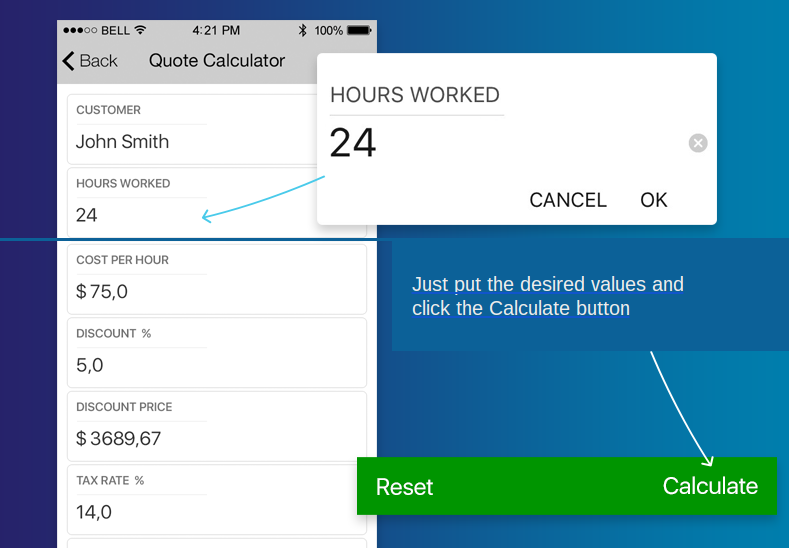 It's always a good idea to test out your features, so after you save the app, we recommend bringing it up on your phone (or the preview module) to punch in some numbers in the calculator. If it works, you probably don't have to go back and change anything, but most of the problems that occur with the app have something to do with a bad equation in your Google Sheet. Also, make sure your calculations and equations are located towards the upper left hand corner of the Google Sheet. This way you won't have to make the app look around for the configuration. Who Might Consider Using the Calculator App? It's funny when you start to realize just how many businesses and individuals could utilize calculators for in-house or customer calculations. So, we recommend you check this app out, since you're bound to improve the way you interact with your customers with it. Also, drop a line in the comments section below if you have any questions.